Don’t you just love it when a plan doesn’t come together? Of course, for me, this usually means nasty weather and bad lighting on a day when I finally get a chance to do some baking. I really haven’t had much time to bake anything of late, much less post recipes here when I do. Hopefully, all this being pulled in a gazillion directions at once will settle down soon and I can start scheduling baking and blog post projects again. Not one, but four days of doom and gloom. I brought out all the heavy artillery. Then I gave up and just took these shots. 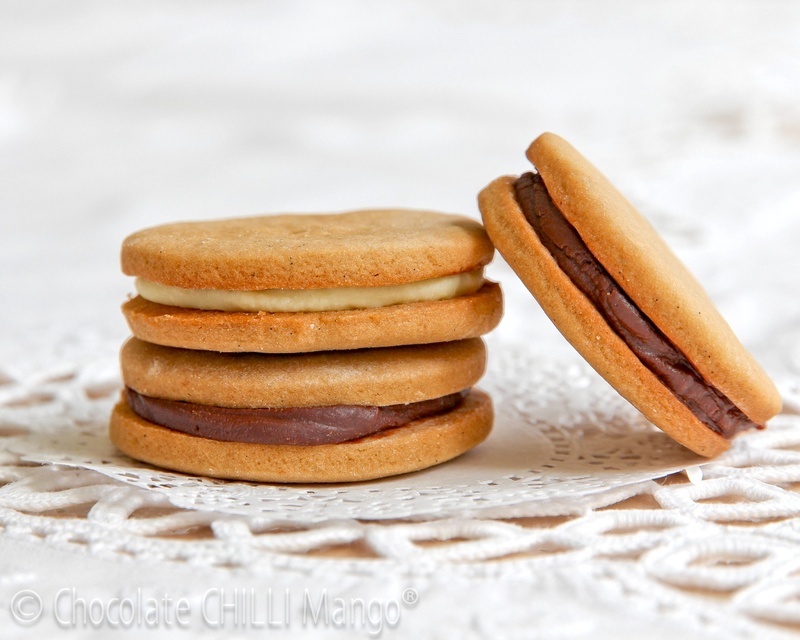 Not enough to showcase the simple yumminess of these tender cream cookies with their luscious ganache centres. Enough for you to get a visual of some description of them though. Making do this time, peeps. But trust me when I say that these cookies are yummy. The cookie dough starts off with a delicious and simple brown sugar frosting. You could stop there and just use that to top off some cupcakes. But keep going and you get a lovely soft cookie that you can form into balls and flatten or roll and cut into cookie shapes. The dough is very soft so take care when rolling it out. 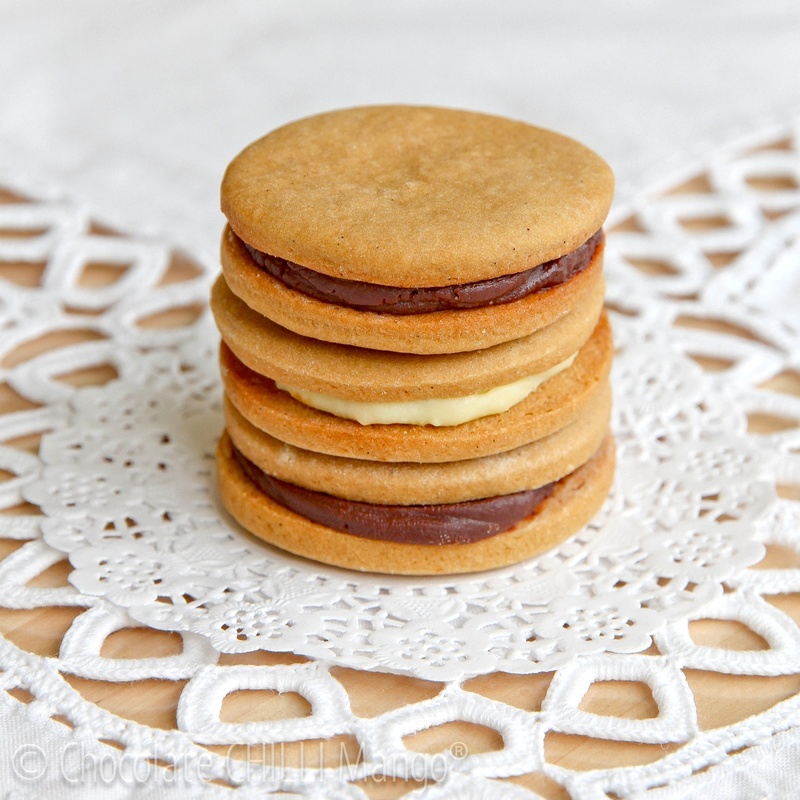 It’s very versatile and I’ve even made these cookies as simple mounds with a thumbprint of jam. They’d be great with a jam and frosting centre too. Enough of my natter … over to the cookies! *For the best flavour, make your own caramel (follow the link to the recipe). But if you are pressed for time, or can’t be bothered, use a good quality bought caramel or caramel syrup. If using a syrup, you will need to adjust the quantity. Start with a small amount (one or two tablespoons) and taste test it before adding more. Preheat oven to 180℃. Line 2 baking trays with non-stick silicon paper. Add the egg and beat until smooth and light. Sift together the flour and bicarbonate of soda. Add to the frosting batter and beat until light. Scrape down the sides of the bowl with a dough scraper. Refrigerate the dough for 20 – 30 minutes. This will make it easier to handle. Roll the dough into a log. You can either roll balls of dough and flatten them into cookies (lightly flour your hands to prevent sticking) or you can roll out the dough and cut out cookies. I’ve done it both ways with success. If rolling out the dough, I prefer to do so between two sheets of silicon paper and I just lightly flour the dough to prevent sticking. If rolling out the dough, use a very light touch. Re-roll scraps to make more cookies but try not to re-roll them too many times. It can help to roll out the dough one-quarter at a time. Use a cookie cutter or glass to cut out cookies and a spatula to transfer them to the baking sheet. I used a 5.5cm cutter to make large cookies this time. I’ve also used a 3.5cm cutter to make smaller ones, which I quite like. Bake cookies for 10 – 12 minutes. Remove from the oven and use a spatula to carefully transfer them to a wire rack to cool completely. When cool, match up the cookies for filling. Pipe your chosen ganache or other filling on to one half. 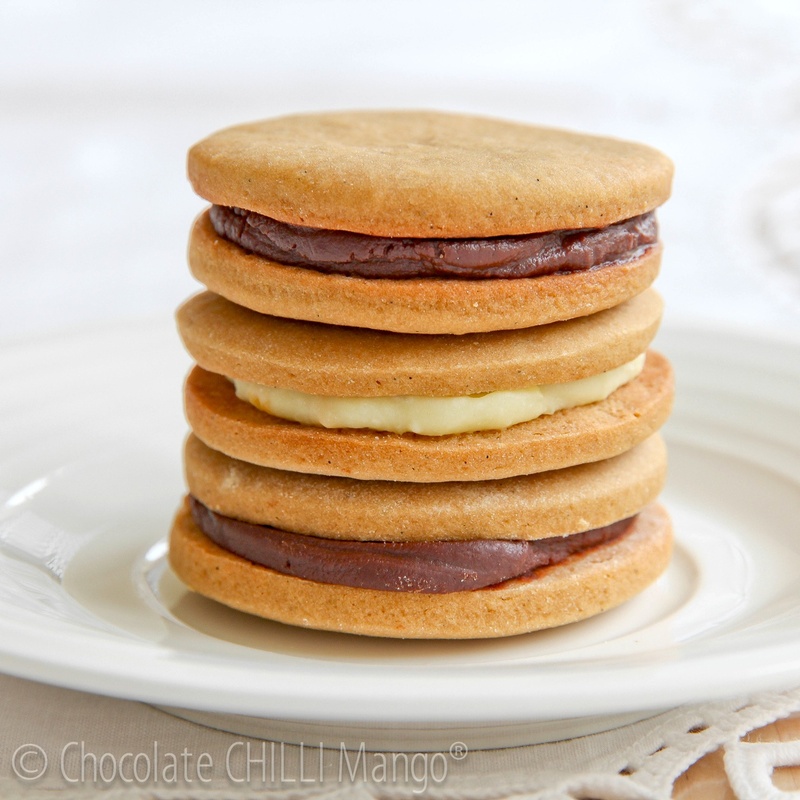 Place the matching cookie half on top and gently twist together to spread the ganache evenly. This is better than pressing down on them and prevents cracking the cookies. Store the cookies in an airtight container. They will keep for several days. Chop the chocolate into small even pieces and place into a heatproof bowl. Add the sea salt and caramel. Heat the cream until it reaches boiling point. Pour evenly over the chocolate. Let sit for 30 seconds and then stir or whisk gently until smooth. While still warm, add the butter and stir or whisk until smooth and shiny. Set aside to cool and set to a piping consistency. You can refrigerate it, if required. If making ahead, there should be no need. Chop the white chocolate into small even pieces and place into a heatproof bowl. Add the orange zest. Heat the cream until it reaches boiling point. Pour evenly over the chocolate. Let sit for 30 seconds and then stir or whisk gently until smooth. While still warm, add the butter and liqueur, and stir or whisk until smooth and shiny. Set aside to cool and set to a piping consistency. You can refrigerate it, if required. If making ahead, there should be no need.